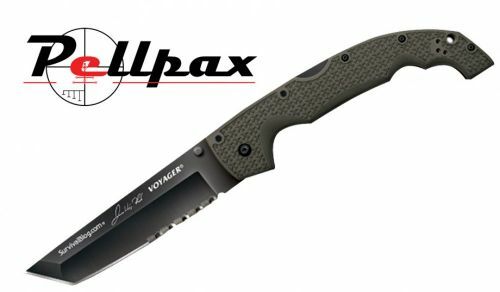 The Rawles Voyager is a high quality folding knife from cold steel. It's ergonomic design and specially choose materials ensure comfort, control and a reliable knife ready to take on any cutting job you have. Made to be comfortable and provide a strong grip the handle of the Rawles Voyager is made from Grivory. This material then has a deep texturing to ensure optimal grip even in the wettest of conditions. The dark green handle doesn't make the knife stand out helping you keep discrete. This folding knife weighs only 7.8oz and has an ambidextrous pocket clip allowing you to easily carry it around. The 5.5" blade has been forged using XHP Alloy. This extremely strong alloy is known for it's high resistance to rust, corrosion and wear. The High percentage of carbon helps reinforce the blade making it very strong and able to take on tough cutting jobs.